Welcome to the third week of the Blogging Belinda series! 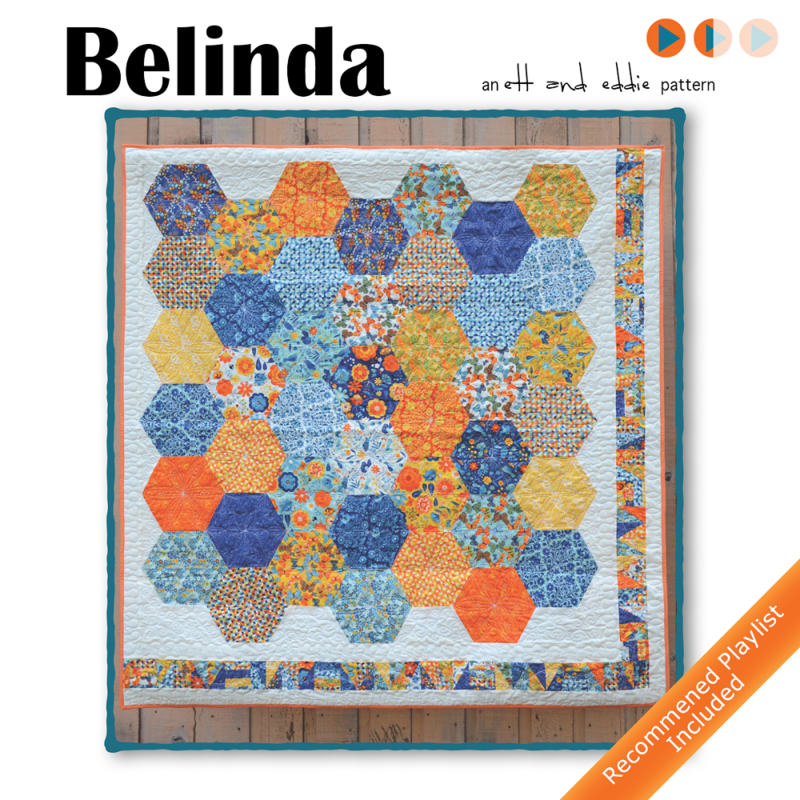 We’re taking a fresh look at our giant hexagon quilt pattern, Belinda and getting beyond the classic layer cake for the basic fabric requirement. Last week we covered some easy strip-pieced hexagons. This week we’re looking at one more simple way to make pieced hexagons for the quilt using various shapes of scrap fabrics, and where else to find inspiration to create your own designs! Our latest pieced hexagon uses some smaller squares – 3 1/2″ and a 2″, along with some trimmed 2″ strips of fabric. The picture below shows some of the assembly in progress; make a 4-patch out of some of the squares and two 2-patches to go with. You’ll trim the two longer 2″ strips to 6 1/2″ long, and the two shorter ones to 3 1/2″ long. Once those units are made and pressed open, the rest of the block goes together as an off-center nine-patch. Sew the rows together, and then join the rows. Then, as before, using the paper templates provided with the pattern to cut out the hexagon shape, or following the directions to use a 60 degree ruler. Frankly, there’s a simple secret to making these pieced hexagons: sew fabric together! My brain tends to work like a giant Tetris game most of the times, so I like to lay out fabric pieces like a jigsaw puzzle and starting joining them together. If you like a more free-flowing, improv style, the 2nd from the left may be your style; start with a center piece of feature fabric, then start attaching more pieces all the way around until there are no raw edges of the center piece left. Next week we’ll look at the finishing touches for this fun, scrappy quilt!